Why is Russia struggling with slow Internet again, and what does Yandex plan to do about it? 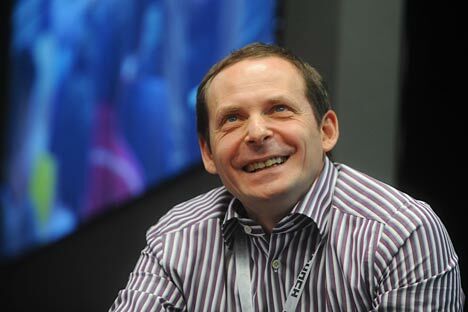 In an interview with Anastasia Golitsyna, Yandex CEO Arkady Volozh answered these questions and more. As of October 2012, Yandex became not only an internet search engine but also the creator of a new web browser. Yandex decided to develop its own “window to the Internet” to match fierce competition on the search engine market – especially from its main competitor, Google. Anastasia Golitsyna: What made you get involved in the “platform fight” and enter the highly competitive browser market? Arkady Volozh: In the past, we always stuck to the strategy of accommodating other platforms, rather than competing with them. We thought of browsers as a separate industry that could be upgraded with cloud services, and that is what we did. But then, a couple of years ago, everyone began unexpectedly devouring everyone else. Google launched its Chrome browser and kept competitors out of it. A.V. : Then why haven’t they corrected their mistake after more than a year? Put it this way: a 3 percent share cannot be a mistake. What is happening now is a huge movement against the internet neutrality that everyone was fighting for before. Before, the prevailing principle was one of openness and equidistance of all services from platforms and devices – now that’s in the past. We were on good terms with Mozilla for a long time, but then that company was bought and it became clear that we would have to create our own browser. We still have very good relations with Opera. We’re making a platform together. A.G.: Doesn’t that mean that you may acquire Opera? A.V. : Or they may acquire us? (Laughs.) No, it doesn’t. For now we’re friends with Opera and satisfied with it. Apple, Google and Microsoft offer people their devices. So what are independent developers supposed to do? We used to think of ourselves as a small company: Since we couldn’t do everything, we would concentrate on services. That is how it was until recently. There was a situation with Google, when its maps were excluded from Apple’s platform, and we had to change our strategy. This is fairly difficult since, if you have to make a platform and all the services on it, then, in order to recoup your outlay, the platforms needs to begin working right away all over the world. For a local market this is expensive to do. That is why we are taking our services to the world. But product always takes priority over platform. If there is no good product on a platform, then that is a minus not only for the developers of this product but also for the platform. A platform without products will not survive. Microsoft is about to launch Windows 8. It’s important to Microsoft that products are developed for this operating system; the company is now going around to developers and asking them to do this. When there is interdependence, it is always possible to forge alliances. A.G.: How will you deal with all of this? Are you planning to defend your interests, to appeal to the anti-monopoly organs? A.V. : We’ll make good offers. If they really are good, then platforms will be lining up and wanting to install them. We’ve already been asked to make apps for many platforms. That means that we are of use to people — and we can always come to an agreement. Apps are a key item. For now we are making all of our apps for all the basic platforms. We continue to think of the Internet as open. In case of “war,” we will not make apps for all platforms or create new apps only for those platforms with which we are on good terms. If the situation becomes unfavorable for us, we may decide to make our own mobile platform. We have a company called SPB Software and could do this on the basis of their products. But to launch and promote one’s own platform would require enormous resources and a change of focus for Yandex. So, we would do this only as last resort. A.G.: Will the launch of your new browser raise your share? A.G.: Analysts often criticisize Yandex for having a poorly diversified business model that makes earnings entirely dependent on ad sales. Do you plan to move in the direction of paid services to lessen that dependence? For instance, you’ve already launched your paid mobile Yandex Music. What’s next? A.V. : The way the internet economy works, hundreds of billions of global dollars are made on devices, tens of billions of dollars are made on advertising and a few billion are made on the sale of content – music, films, books, etc. In other words, all that content taken together is only a tenth of the value of the advertising market. Sales to iTunes as compared with others look like big business, but iTunes is more of a driver for sales of Apple devices, which add up to hundreds of billions of dollars. When people say that Yandex has an undiversified business model, they forget that it’s based on hundreds of thousands of clients. In other words, it’s strongly diversified inside. All segments are represented. If, for example, there’s another financial crisis, then sales of medicines will increase. People are always buying something. For now we have only one paid service: music on mobile devices. And only because the copyright owners insisted. If you look at this market, you will see that nowhere in the world can free legal music services on mobile devices be found. We very much wanted to become the first such company, but we weren’t able to convince copyright owners. A.G.: Are your music sales strong? A.V. : We’ve made some money, but not much. If we had a choice, we would give the music away for free. We think that music should be monetized with ads. So far, we have no plans to engage in direct music sales through the web. In any case, revenues for content are nothing compared to the advertising market. Even iTunes, with all the power of Apple behind it, makes only about $4-5 billion. A.G.: Yandex created its IPO almost a year and a half ago. How do you like life as a public company? They say that, after an IPO a company has to cater to its investors, this prevents it from freely conducting business and launching services with long-term returns. What is your situation? AV: We are not very oppressed by our status as a public company. Before the IPO, Yandex was already a fairly major company; since the IPO, no great changes have taken place inside the company. We spent a long time preparing for this investment, so we didn’t have to suddenly re-do something from scratch. Even before the IPO, we spoke to investors on a regular basis and presented our accounts. A.G.: Do you have plans for a repeat investment? A.V. : You had better ask our investors about that. As a company, we have no plans for any repeat investments. We still have a fairly substantial means from the IPO — several hundred million dollars. We have spent almost none of the money from the IPO. A.G.: Is it possible to say how many Yandex employees made substantial money on the company’s IPO? Is there anyone who used that money to start his own business? A.V. : The Yandex IPO and options program created more than 100 millionaires among employees of the first and second wave. This year we expanded our options programs to include several hundred more people. A.G.: You recently said that Yandex is making a worldwide search engine and planning to index as many sites as possible – not only on ru.net but all around the world. How is this project going, do you have a large base? A.V. : We have indexed some 30 billion documents. We now have an index of the same caliber as that of leading world search engines. We have entered the major leagues in search engines. Only Google and Bing have an index as large. A.G.: What do you plan to do with your index? Such an enormous index is hardly necessary for just the Russian market. A.V. : No matter what local market you enter, you have to be able to meet global search needs. Our world search index now works in Russia, Ukraine and Turkey. First published in Russian in Vedomosti.ru.